Exeter SETsquared student start-up, Pulsenotes, a new online medical revision service, has secured capital investment of £40,000 from the founder and CEO of airport lounge operator No.1 Traveller; Phil Cameron. 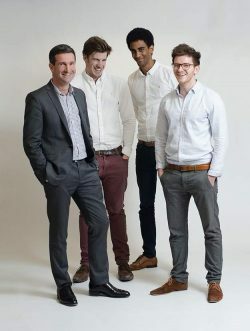 Founded by junior doctors Ben Smeeton, Ben Norton, and Sam Belete, Pulsenotes provides high-quality video lectures, revision notes and applied self-assessments to help medical undergraduates revise. With an introductory offer of £30 for an annual subscription, the service equates to the price of a standard medical textbook. Alongside support and grants from both the Exeter Innovation Centre and Student Start Up at the University of Exeter, the funding from Cameron will support Pulsenotes’ launch in January 2016. Founder Ben Smeeton commented: “We have a shared ambition to simplify medical education and know that Pulsenotes will offer a fresh approach to undergraduate learning. Phil Cameron added: “I struggled to get the funding and advice I needed to start and grow a successful business. It took No.1 six years to get any backing from the bank and the support now offered from Exeter and other universities is outstanding.